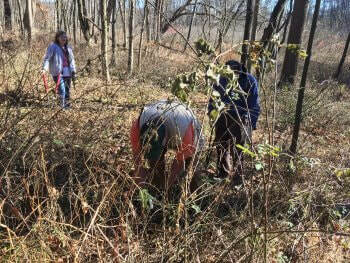 On Wednesday, November 29th (rain date), 9 ONAPA volunteers and 2 DNAP staff worked in the woods around Bonnett Pond Bog to remove and treat bush honeysuckle, Japanese barberry, multiflora rose, common privet, as well as litter. It was a beautiful day and we were able to get alot accomplished. Although this was the last ONAPA stewardship project for 2017, we will be planning another trip to Bonnett Pond Bog this winter to control woody plants on the bog mat, which is difficult to access (hopefully it will freeze). Stay tuned for a few more projects over the winter before our regular stewardship schedule starts again in late March or early April! 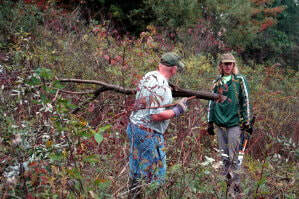 On Tuesday, November 14th, 6 ONAPA volunteers, 4 Division of Wildlife staff, 5 Toledo Metro Parks staff, one USFWS staff, 2 Ohio Certified Volunteer Naturalists, and one Bowling Green State University student worked together to cut and treat woody sprouts in the "bowl area" of Meilke Road Savanna Wildlife Area in Lucas County. It was a great cooperative project between 3 agencies and ONAPA to accomplish significant habitat restoration in this important area for Karner blue butterflies and rare plants. Species cut and treated included oaks, sassafras, autumn-olive, black poplar, and buckthorn (glossy and common). While the Division of Wildlife conducts prescribed burns and mowing regularly, the removal and treatment of woody sprouts with herbicide will control the sprouting and maintain the open savanna habitat. This small wildlife area contains many state-listed plants and high-quality habitat for the Karner blue butterfly and other rare butterflies in the Oak Openings. On Wednesday, October 25th, 8 ONAPA volunteers and preserve manager, Michelle Comer worked at the Headlands unit of Kiser Lake Wetlands State Nature Preserve to remove woody species from the fen meadow. There is plenty of work to be done in this meadow to restore it, including removal of woody species and invasive cattails. The group was able to clear and treat (with herbicide) willows, dogwoods, and ninebark in a significant portion of this meadow. 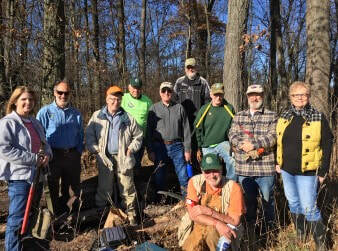 On Saturday, October 21st, ONAPA partnered with the Killbuck Watershed Land Trust (KWLT) at Brinkhaven Oak Barrens natural area to continue the important work of restoring the north barrens. There were 21 volunteers, including 5 representing the Land Trust, who cut and hauled brush and trees in the north barrens. These volunteers included 3 ONAPA Board members. The cut stems were treated with herbicide to present re-sprouting. The north barrens has responded very well to the stewardship work we did last year and the opening is looking great - lots of little bluestem and Indian grass, with a variety of prairie forbs. After the project was done, ONAPA participated in a gathering with 15-20 KWLT Board members and landowners to visit and take a tour of the north barrens. KWLT President (and ONAPA volunteer), Randy Carmel led the tour, which was the first time for several KWLT Board members to see the area. ONAPA has been partnering with KWLT for three years - this is an excellent example of ONAPA coming to the rescue on other natural areas than DNAP's state nature preserves. 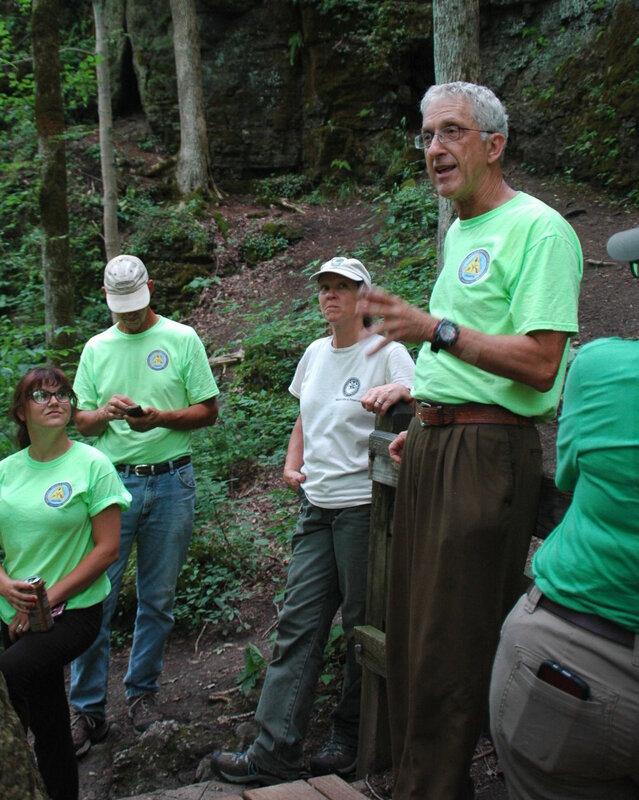 We are so pleased and proud to work with this NE Ohio land trust! On Thursday, October 5th, 5 ONAPA volunteers and 3 DNAP staff worked at Karlo Fen SNP to remove woody species invading the small fen meadow. 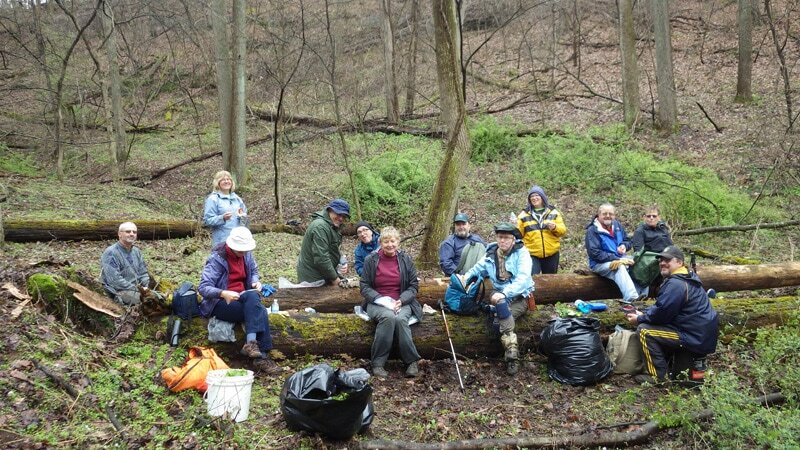 Although it was cloudy, the group was able to clear out a significant portion of the meadow in 3 hours, removing willows, glossy buckthorn, multiflora rose, and dogwoods. Poison sumac was in its peak fall color - impressive, but good to avoid! On Saturday, September 30th, 9 ONAPA volunteers and DNAP preserve manager, Charlotte McCurdy worked to remove invading woody species in several fen meadows along the boardwalk at Jackson Bog SNP. 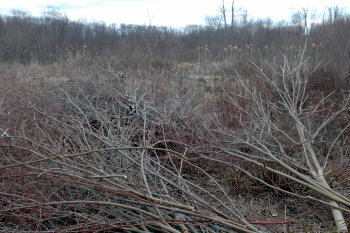 Woody stems were cut, removed, and treated with herbicide to prevent resprouting. There was a short field trip after lunch to see some of the fen's rare and blooming plants. ONAPA continues to help restore the fen meadows which have become very degraded. On September 27th, ONAPA had a very productive stewardship project at Kent Bog SNP with several partners including 4 Dawes Arboretum Residents, 3 members of the Friends of Kent Bog, and a class of 18 students from Kent State University with Dr. Melissa Davis. ONAPA had 6 volunteers and there were 4 DNAP staff. 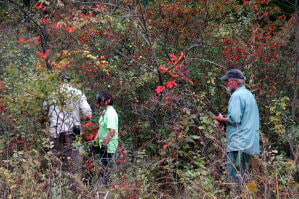 We all worked together on cutting invasive woody species such as glossy buckthorn, Amur honeysuckle (in the uplands around the bog), and larger red maples. 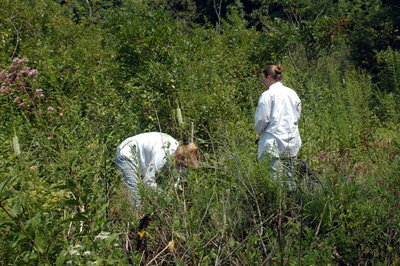 The larger glossy buckthorn were cut and treated with herbicide, while the smaller seedlings were hand-pulled. Glossy buckthorn is a significant problem at Kent Bog, so it was excellent to have a large group cooperating to control the species. Preserve manager, Adam Wohlever, led a short field trip after lunch along the boardwalk. The Goodyear blimp even passed over us while we were working! On a hot, humid day, September 20th, 3 DNAP staff and 8 ONAPA volunteers worked at Springville Marsh SNP to control narrow-leaved cattails and woody species in the fen meadows. 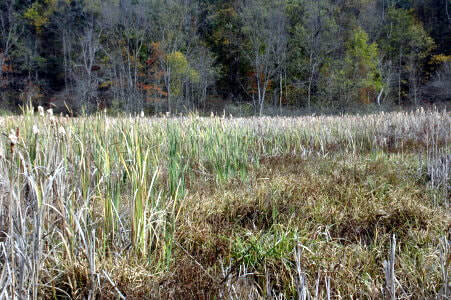 Herbicide was applied to the cattail leaves and cut woody stems. 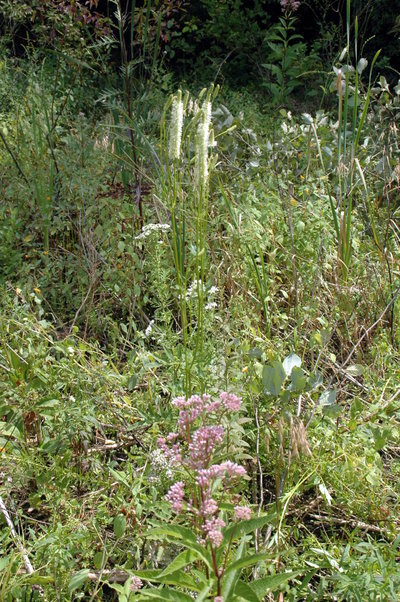 These invasive plants are impacting the remaining small fen meadows by shading out the native fen species. Preserve manager, Ryan Schroeder took the group on a short field trip after lunch - we enjoyed seeing flowering fringed gentians and ladies'-tresses. 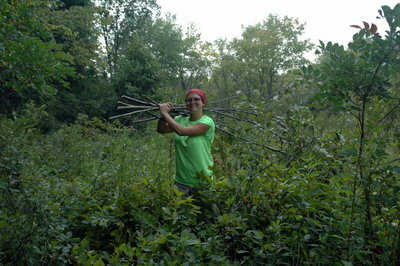 ​On Saturday, September 9th, twelve ONAPA volunteers and preserve manager, Michelle Comer worked in the savanna area of Gallagher Fen to remove woody species in the understory. This was a continuation of the work we did last year to open up the savanna above the main fen meadow. We cut and treated large Amur bush honeysuckles and other woody species in the understory, in an effort to restore the savanna and encourage prairie plants. We also had a nice hike on the boardwalk and trail around the main fen, seeing many fen and prairie species in bloom. ​On August 23rd, 3 ONAPA volunteers and 3 DNAP staff including preserve manager, Adam Wohlever, worked at Gott Fen SNP to remove and treat invading woody species such as glossy buckthorn and dogwood. The high-quality boreal fen meadows support many rare plants including bayberry, showy lady's-slipper, and round-leaved sundew. The meadows should be kept open with few woody species to prevent shading of the fen species, so this stewardship is critical to the maintenance of the fen and its rarities. ​Six ONAPA volunteers and preserve manager, Charlotte McCurdy worked at Jackson Bog SNP on August 16th to remove purple loosestrife, hairy willow-herb, and cattail in the fen meadows. 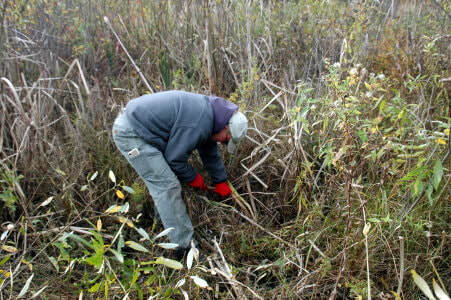 It was a warm, humid day, but we removed 18 bags of purple loosestrife, which is extensive in the meadows. 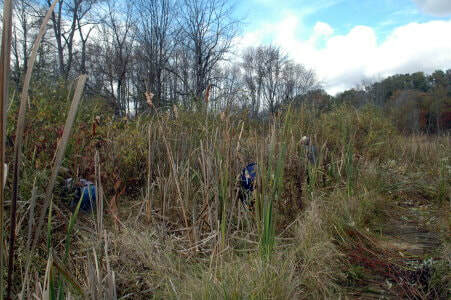 We also cut and treated some invasive cattails. Both Will and Emily, ONAPA's stewardship assistants, attended this project and worked hard to remove many flowering loosestrife. 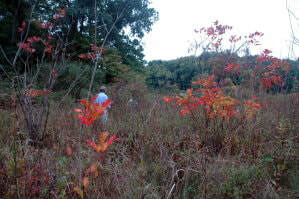 On the next project at Jackson Bog on September 30th, we will focus on woody species removal in these meadows. 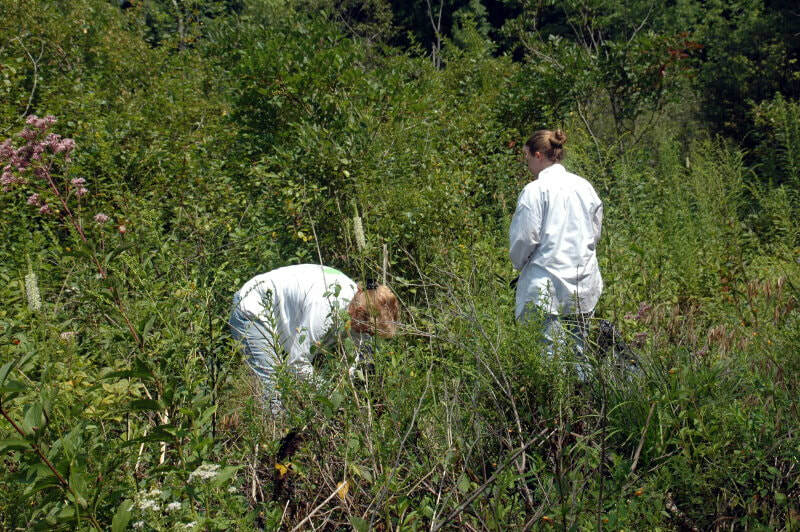 On Wednesday, August 9th, a small group of 4 volunteers along with preserve manager, Charlotte McCurdy and ONAPA stewardship assistants, Will and Emily worked at Myersville Fen SNP to remove woody invasives, purple loosestrife, and hairy will0w-herb. There is much work to be done in the two small fen meadows, but we accomplished alot during the 4 hours we worked in one of the meadows. Located in the backyards of a housing development in Uniontown, the preserve is also impacted by yard waste and invasives coming from residents' landscaping. Fortunately there were several impressive fen plants blooming which made the mucky work all the more worthwhile - shrubby cinquefoil, Canada burnet, joe-pye-weed, mountain-mint, Kalm's lobelia, and seaside arrowgrass (Triglochin palustris). 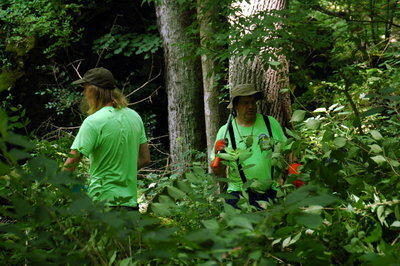 On Wednesday, June 21st, a hardy group of 11 ONAPA volunteers and DNAP preserve manager, Michelle Comer ventured to the scientific side of Clifton Gorge (permit-only) to work on controlling invasive shrubs such as Amur honeysuckle, Japanese barberry, and common privet. 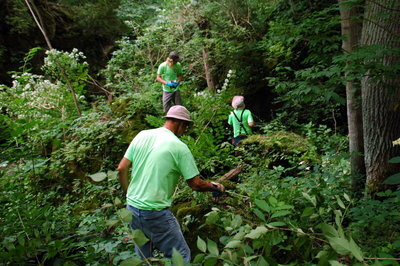 It was quite a hike, and climb for some to reach the lower regions, where we were able to cut and treat the stems of invasive shrubs which are threatening rare plants like red baneberry. 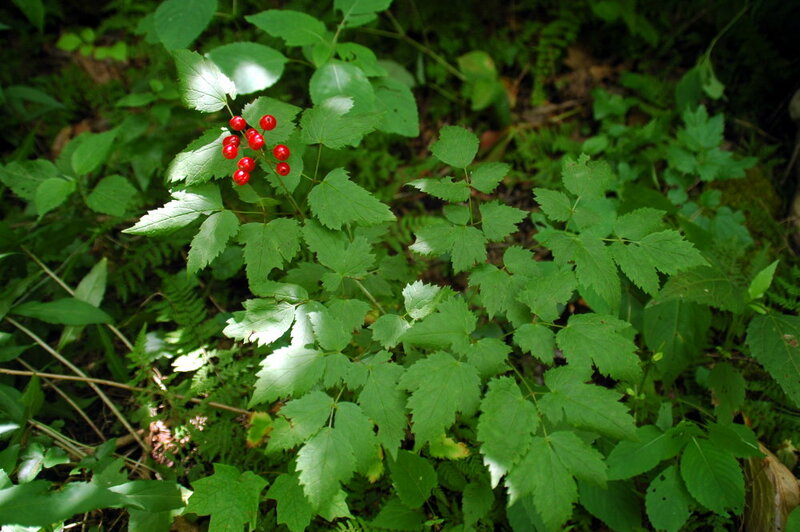 We were fortunate to see some red baneberry in fruit. After working for several hours, we had a short hike on the interpretive side where Tim Snyder talked about the history and geology of the preserve. Although it was a warm, humid day, we accomplished alot of management and had a great day in a spectacular preserve. 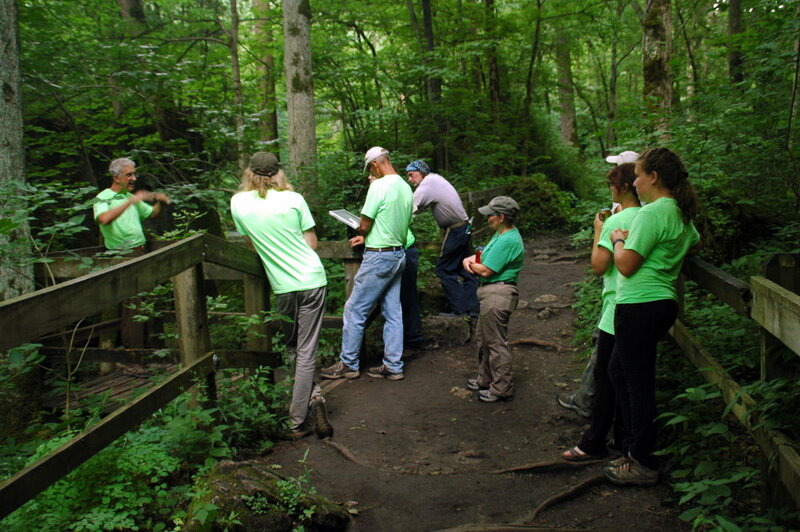 ​On Wednesday, May 17th, 19 volunteers worked at Collier Preserve to control garlic mustard. This group include 12 from ONAPA, 3 from DNAP, and 4 from AgCredit (a local community service program). We worked in the floodplain area on both sides of the trail where the wildflowers are abundant and lush. We pulled many bags of garlic mustard, which were ferried back to the parking area by DNAP using an ATV and small trailer (see photo). The garlic mustard was then loaded on a trailer behind a truck (see photo), so it could be disposed of away from the preserve. It was a large load of garlic mustard, with more left to be controlled in the preserve. We were thankful for the extra help! 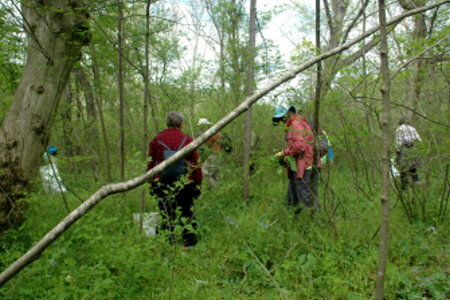 ONAPA along with DNAP volunteers and staff covered a large floodplain area at Lake Katharine State Nature Preserve on Tuesday, April 25th to scout for and pull garlic mustard. 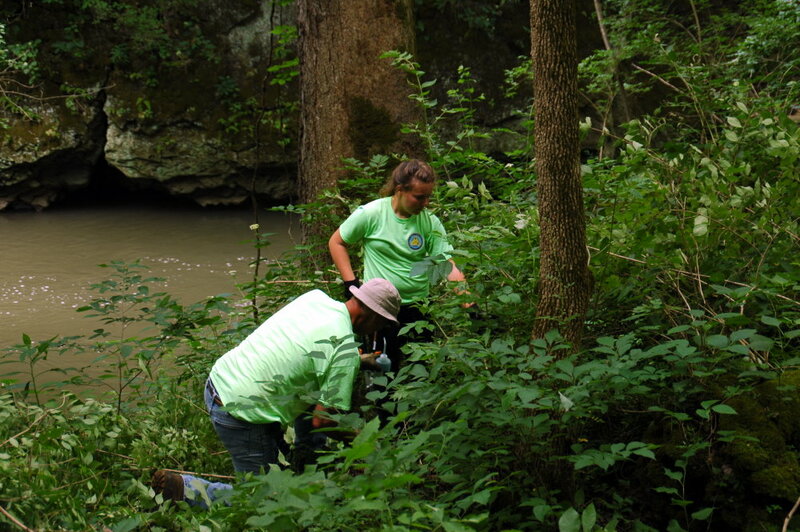 There were 10 ONAPA volunteers, 3 local DNAP volunteers, and 2 DNAP staff, including preserve manager, Josh Deemer participating in this stewardship project. We pulled 7 large bags of garlic mustard from this area, which also had excellent spring wildflowers. After pulling garlic mustard, Josh led us on a nice hike to a different location in the preserve to see an impressive waterfall. 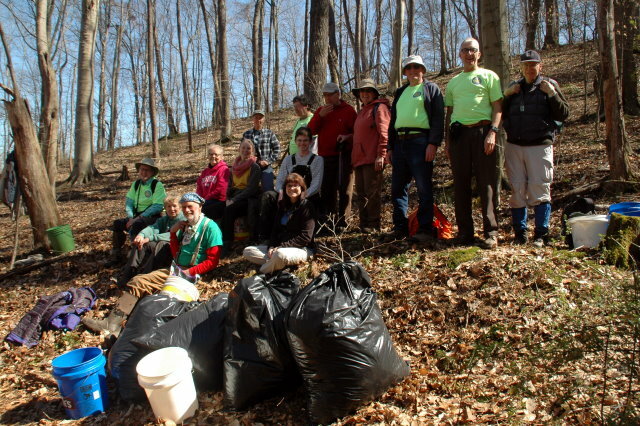 On Thursday, April 6th, 10 hardy ONAPA volunteers and 4 DNAP staff/volunteers worked at Christmas Rocks SNP for 4 hours to pull garlic mustard. The weather forecast was for rain and high winds, so we had a smaller group than expected, but with 14 people, we pulled 7 large bags of garlic mustard in a ravine that had a significant amount of this invasive plant. 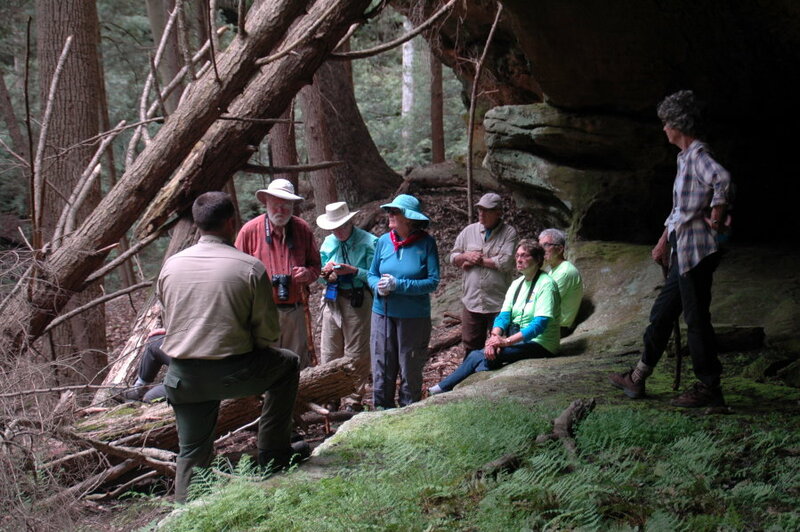 After lunch, a small group went on a field trip with Jim Osborn, retired DNAP preserve manager, and saw an excellent array of spring wildflowers and sandstone rock formations. It was another successful stewardship project - we greatly appreciate the commitment of ONAPA volunteers. 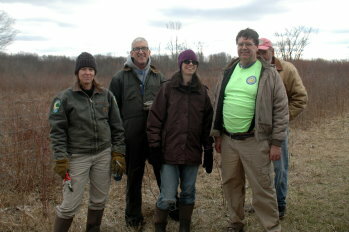 On Wednesday, March 29th, ONAPA had a very successful stewardship project at Rhododendron Cove State Nature Preserve. 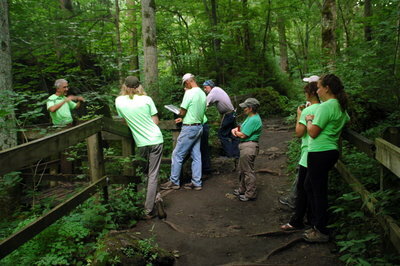 Along with preserve manager, Levi Miller, there were 20 volunteers, an excellent start for our season. We pulled garlic mustard along the hillside below the great rhododendron population - 5 large plastic bags or over 250 pounds! After lunch, we had an amazing field trip through the rock formations which were truly impressive (permit-only to most visitors). 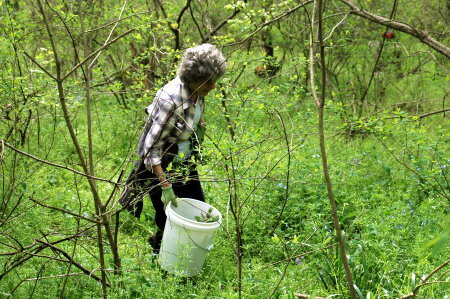 While there is still more garlic mustard to pull, we all felt we made a huge dent in the population. 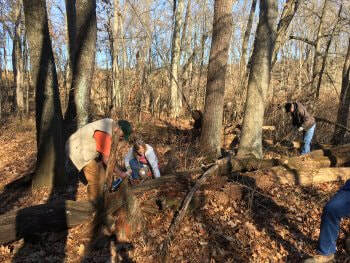 On Wednesday, March 8th, ONAPA partnered with the Killbuck Watershed Land Trust to conduct more habitat management in the north barrens of Brinkhaven Oak Barrens in Holmes County. 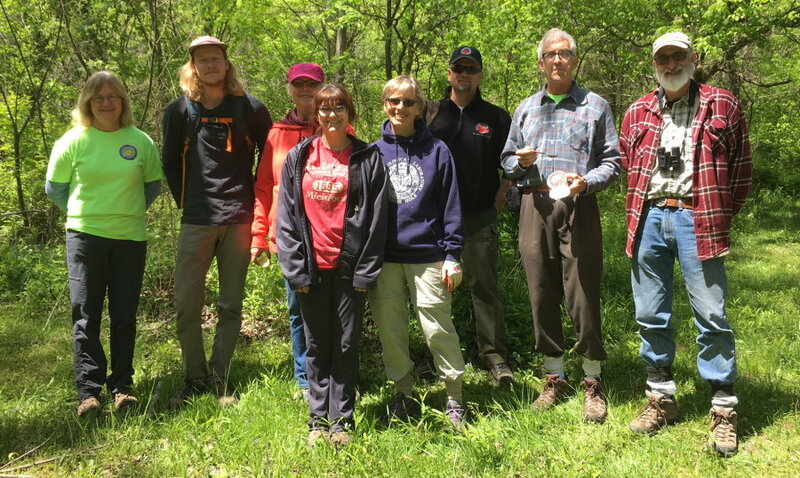 Fourteen volunteers worked for 3-4 hours clearing brush that had been cut at the October stewardship project, as well as cutting more brush to open the prairie opening. This work will significantly enhance the north barrens, so we are excited to see the response from the prairie species this summer. The day also included a short tour of the south barrens. On February 15th, 4 staff from DNAP and USFWS along with 4 ONAPA volunteers worked at the Medway Prairie Fringed Orchid site to cut and remove woody species (dogwood and willow primarily) from the small meadow. This was a follow-up to our November 17th project last fall as there is still a lot of woody vegetation encroaching on the meadow. The cut stems were treated with herbicide and the brush was removed from the meadow. We are hopeful that this habitat management will be beneficial to the orchids this season, which typically bloom in late June.